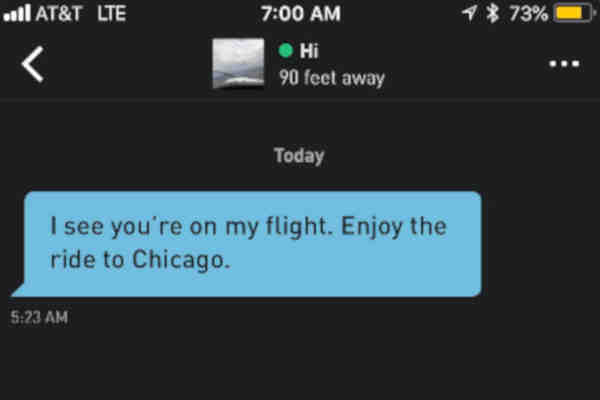 A Delta passenger told the New York Post that his pilot messaged him on Grindr, the leading hook-up app for gay and bisexual men, while the plane was mid-air. Twenty-seven-year-old JP Thorn told the paper that the exchange happened during a 90-minute flight from Saint Paul to Chicago in August. Thorn said that he noticed the message after the plane landed. “I see you're on my flight. Enjoy the ride to Chicago,” the pilot allegedly wrote. According to Thorn, the pilot sent the messaged roughly 30 minutes before the plane landed in Chicago. Thorn posted a screenshot of the message on Twitter. As of Friday, the post had nearly 220,000 likes. “He tried to find me after the flight too,” Thorn said in a tweet. Thorn, who continued to message the pilot while waiting for a connecting flight, described the pilot as “a nice guy” and said that he “totally would have met him for coffee” under different circumstances.